Hi friends! Back with a recipe for you now that my vacation posts are all finished. We're finally getting back to normal after a week or so of jet lag. I had to hit the ground running with a big work event right when we got home, so this is the first week where I feel like I'm in my normal routine once again. This is also the first week I had the opportunity to actually get back in my kitchen and make homemade meals again. My biggest issue with traveling like we did through the UK and Iceland is that I just miss eating a simple light meal made by my own hands in my own kitchen. Don't get me wrong, I love to eat out, but I also just love to eat a simple salad or whatever else I'm craving instead of being limited to whatever I can find on the restaurant menu. 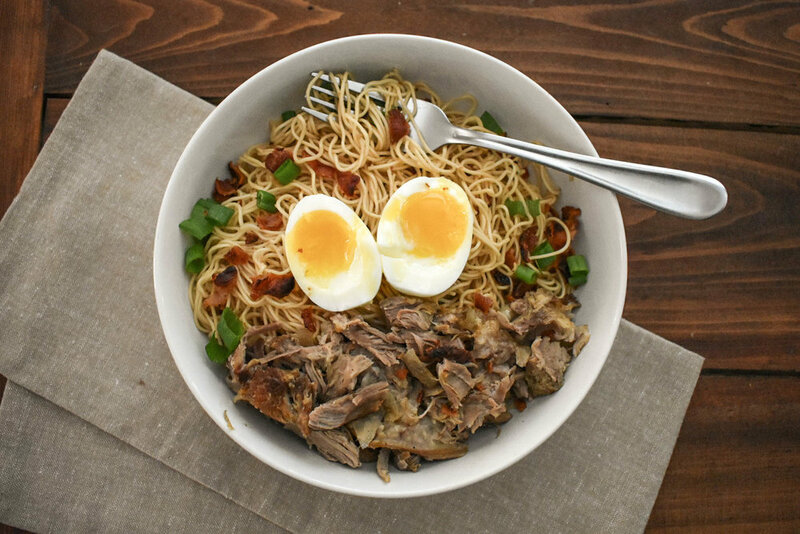 This ramen was the best way to be welcomed back to my kitchen. We woke up bright and early Sunday morning after the time change, which worked out well for getting the pork into the crock pot. The house smelled delicious all day. Andy and I have a ramen spot in Tampa that we love (along with the majority of people who have ever been to Ichicoro) and this meal is a spin-off of my favorite dish, the Spicy Abura Soba. 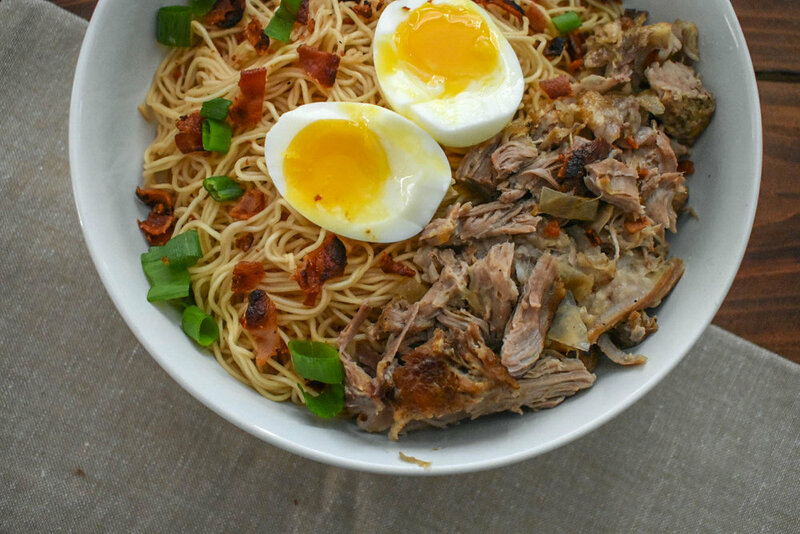 It's a brothless ramen, which I like since it means less slurping. The soft boiled eggs provide an additional sauce when you mix the bowl up together. I'd never cooked with chili oil before either, but it added the perfect heat to the sauce to spice it up without it overpowering the flavor of the pork. And the pork. So delicious. So tender. So flavorful. It is cooked with broth, ginger and garlic and takes on all of those flavors. In a pan over medium-high heat, sear each side of the pork for 5 minutes. Into your crock pot, add 3 cups broth, onion, half of the ginger, and 3 cloves minced garlic. Add the pork and juices to the crock pot, cover, and cook on low for about 6 - 8 hours. When your pork is fully cooked, shred and return to the crock pot. In a small sauce pan, heat remaining chicken broth, chili oil, soy sauce, sugar, remaining ginger, and a clove of minced garlic. Whisk until fully combined and heat through. Add your noodles to the sauce pan and stir to coat. 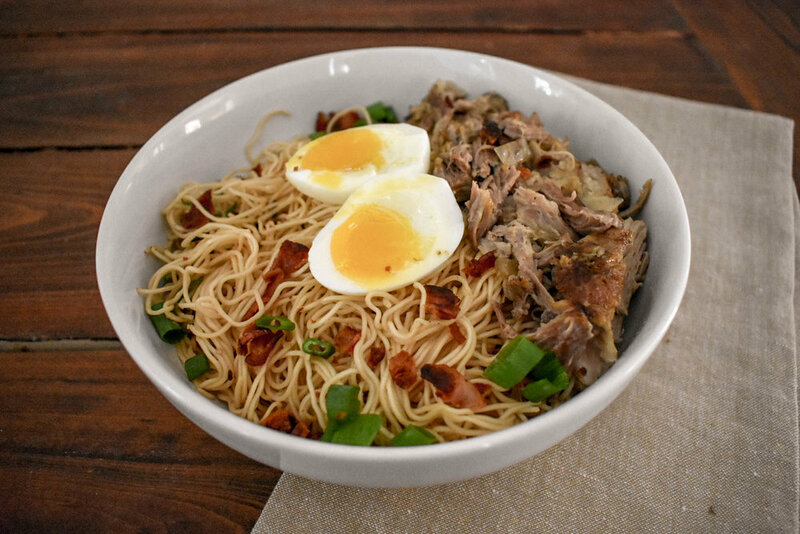 Assemble your bowls of noodles topped with a soft boiled egg, crumbled bacon, shredded pork, and scallion.